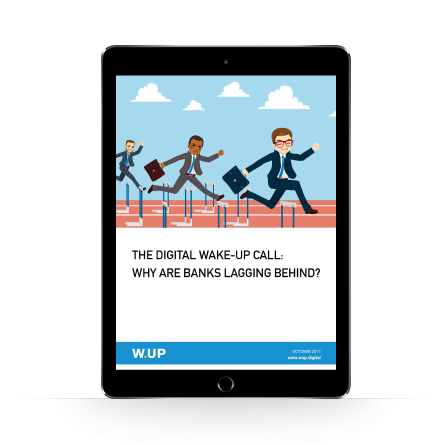 The digital wake-up call: why are banks lagging behind in sales? Download W.UP’s white paper to learn about why financial institutions are 10 years behind the e-commerce giants in offering real-time personalised marketing offers to their customers. Bank executives and analysts see huge growth opportunities in digital banking, while the fast advancement of information technologies, changing customer behaviours and needs as well as the transformation of the financial scene itself represent many challenges for industry players. After years of lagging behind in the digital arena, banks must use the latest fintech solutions to start selling banking products based on the customers’ needs and behaviour. Ongoing and future changes in the financial services sector are often perceived as challenges for banks, but in fact they may be the main drivers of digital development and the overall transformation of the sector.